In recent years, more and more work has been done, and more and more people have become involved in dowsing for earth energies. Consequently a lot more information has been gathered, and new discoveries have been made. At one time, it was enough to get an OS map, mark out the ancient sites, and join them with straight lines, and then take our rods out to confirm that the lines were really there. At that time, ‘Ley lines’ were the in thing, but as time progressed, dowsers fount that the same points were joined by other lines, which did not necessarily go in straight lines. These meandering lines became known as ‘dowsable energy lines’ or ‘DELs’. Then along came Hamish Miller and Paul Broadhurst with their discovery of the now famous ‘Michael and Mary lines’. Work has also progressed on the nature and form of the energy lines. Originally lined were thought of as straight, then meandering. As single lines, then multiples of three. Then spiral energies were found, and now coil energies have also been added to the list. Much has been learnt about the polarities of the lines, e.g. beneficial/ harmful, male/ female, and so on. All of these discoveries have been made using the simplest of tools, including (often home-made) pendulums and dowsing rods. But perhaps the most important tool used by any dowser is the QUESTION. We are all taught that whatever tool we may use, it will only answer the questions we ask. Therefore those questions must be clear and unambiguous. However, asking unambiguous questions is not always that straightforward, and mistakes can be made. The story that follows is a personal experience which demonstrates that sometimes a mistake like this can lead to a new discovery. Like many dowsers, I have OS maps of my local area (Dorset) to which I have added Ley lines by highlighting the usual features and joining them up with a straight-edge. Then along came ‘The Sun and the Serpent‘, which captured my imagination and set me thinking. The first thought I had was that this cannot be an isolated incident – there had to be others. I began by holding a pendulum over a map of ancient Britain upon which ancients sites are given prominence. I then made my first mistake by asking the wrong question. i had in mind that I was looking for pairs of lines which flowed in serpentine fashion, crossing over each other continually, and so this is what I asked for – were there other pairs of lines which behaved in the same way as the Michael and Mary Lines? I got a very firm “yes”. It did not occur to me at the time that there could be other variations on the same theme. Even worse, I did not discover this mistake until much later, when I superimposed the Michael and Mary lines on my own findings and saw that I had found something very different. However, completely oblivious to this, I continued. The map suggested several possibilities. I was drawn to one which ran the length of the country. It was attractive to me because there was a lot of it, and it also passed just a few miles from my home. My pendulum told me this was exactly what I was looking for, and I began to plot the pair of lines by map dowsing. As with the Michael and Mary lines, this one passed through some well-known places, including Arbor Low in Derby shire, and Pilsdon Pen in Dorset (the highest hillfort in England), which is also close to my home. When I went there to check it out with a colleague, Kingsley Bennet (also a member of Wessex Dowsers), we found that Pilsdon Pen is a very busy place with respect to energy lines. Not only did we find that the two lines we were looking for crossed over at this point, but so did several others. Among them was another pair which also crossed over here, but travelled in an East/West direction. 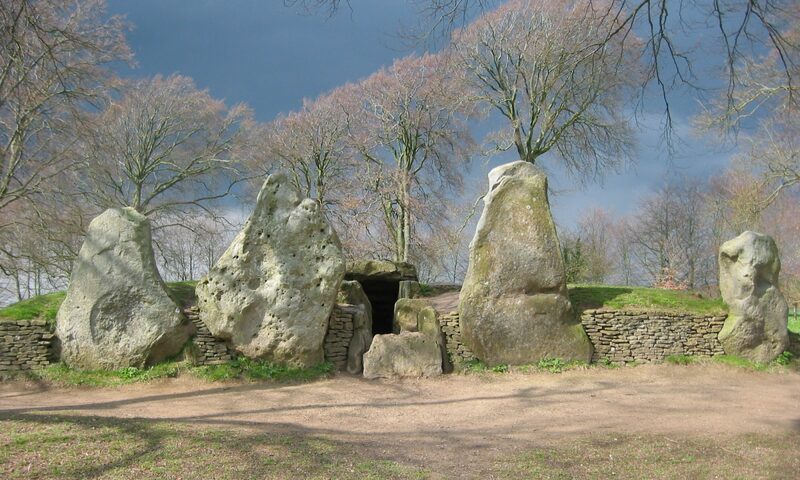 When I plotted this new pair on a map, I found that they passed through Cerne Abbas and Badbury Rings. They were also going to be easier to investigate. These were the events which led to a sizeable map-dowsing exercise in which I went in search of all the serpentine pairs in Dorset, or which there are many. Working in my local area made it easy to check my findings as I went along. It was also at this point that I plotted the Michael and Mary lines and found that I had been plotting lines of a smaller scale, nowhere near as grand as this famous pair. Perhaps it was the large number of lines that I was plotting during the map-dowsing part of the exercise that made me sloppy with my questions and blasé about finding the next one. The question I asked was, “OK, where’s the next energy line?” The outcome was the discovery of a completely new feature which is incredibly complex and the real subject of this paper. I began plotting a new line near Abbotsbury, and followed a gentle curve just like all the other lines. But the curve went on without reversing, and I found myself plotting a line which kept going round and eventually joined up with itself, revealing an oval-shaped feature on the map covering several square miles of territory. At first, I thought I had made a mistake, but the pendulum was insistent. I asked if there were others like this and got a “Yes”. I then found another eight on the two OS maps I was using at the time (I have since map-dowsed over a much larger area. Never having seen anything like this before, I had to know what I had found. Of the nine I had found, the most convenient was the one which went through Cerne Abbas. I drove to the place where this line crossed a straight, but remote country lane. This meant I would not to have to cross private land or ask permission. My rods showed me that the line was there all right, but the real shock was the scale of it. It took nearly ninety paces to walk across the thickness of the line. (I have not found one of these features yet where the thickness of the line is less than seventy paces.) It also appears that the thickness of the line is constant at all points around the oval. This feature was now to get a lot of attention. Before getting more involved, I needed confirmation that I was not deluding myself, so I asked Kingsley Bennet to accompany me to the site to see if he could find anything there. He found the line exactly where I had found it, and confirmed its thickness. Over several visits, we found that we had uncovered a very complex feature which works on several levels (perhaps of different frequencies). We began by asking the standard questions. For instance, when we looked for multiples of three, we found it to have nine lines in three groups of three across its thickness, the central three being much thicker than those outside them. We then found that at another level we encountered six bands; the outer bands being five paces wide and the four inner bands being twenty paces wide. Also the polarity reversed as we went from band to band. While this was very confusing, we were in fact getting closer to finding the basic structure of this feature. It now appears to be composed of lines, coils and spirals, as well as eddy currents set up by the movement of the energies. It also has symmetry. The easiest way to describe its structure is to say that if one walks across its thickness, one first encounters three lines, about five feet apart. This is followed by sixteen coils, about four feet apart and connected by spirals. One then encounters three more lines, just like the first three (see Fig. 1). With the triple lines on the outside and inside of the feature, each line flows in the reverse direction to the one before. The flow in each line sets up spiralling eddy currents, which this far seem to be in a clockwise direction. These eddy currents, while easily detected, should not be confused with the spiral and coil energies in the central section. The central section can best be though of by cisualising the springs of a mattress – row after row of coils – in this case, sixteen rows of coil energies. As one progresses from row to row, the direction of spin reverses, i.e. Row 1 – anticlockwise, Row 2 – clockwise, Row 3 – anticlockwise, and so on. The rows are also connected by spiral energies. Those in Row 1 are connected to those in Row 2 by a spiral energy which is ‘S’-shaped (see Fig. 2). The final point to make is that this 90-pace thick wall goes down into the Earth and straight up, according to the pendulum and rods, into space. Thus the whole oval feature can be seen as a giant tube coming out of, or going into the Earth. These findings have also been confirmed now by Paul Craddock (BSD and Wessex Dowsers), whom I took to the side and watched while he worked. His findings were the same as ours. The big question now is – what are these features? Those who have looked at them agree that they are not man-made. At first glance there are no landscape differences between the encircled territory and that outside. Also at first glance, the scatter of these oval features is not uniform, i.e. Dorset has thirteen of them, Somerset only has four. Several questions have been asked about these oval features. For instance, do they encircle some significant site, like a stone circle or a hill fort? In the sense of, “Is it a dot with a ring around it?”, the answer has to be “No”. A few of the features do have a site within their boundary, but hardly ever centrally situated. Nor does the line itself have to pass through an ancient site. The line of one of the ovals in Dorset passes through the Roman encampment next to the Cerne Abbas Giant, but the only thing on the line of another one, containing no significant sites at all, is a single tumulus. As to their purpose, several suggestions have been made. At the one extreme, it has been suggested that they are some sort of anomaly in the space-time continuum. I confess I have difficulty with this one. I am happier with the suggestion that they may be some sort of ‘blow-hole’ – a means whereby excess energies fromn inside the Earth can escape without causing earthquakes, volcanoes etc. It is hoped that those who read this paper may be inspired to check out their own areas. I have now map-dowsed most of England and would be pleased to indicate likely locations. Finally, it has been suggested that these features should be given a name, and since I found them, it was also suggested that the name ‘Sleet Feature’ might be appropriate. I have no objections to this if no-one else has.